As a university student, I was assigned to give a presentation to the class. I was nervous. Perhaps it was the setting of the class; it felt like the students were too close to me. I practiced several hours for this presentation, and had my note cards ready. I don’t remember the exact topic, but the class covered Texas government and politics. The instructor called my name, and I made my way to the front of the classroom. My heart was racing, and I broke a little sweat. The intimacy of the room didn’t help much. I froze! Thankfully, another student reminded me of my name. By that time, I was both nervous and embarrassed. I finished the presentation in record time, took my seat, and felt stupid (include ridiculous, too). I vowed to improve my speaking skills. Shortly thereafter, I requested my company pay for the Dale Carnegie class, which provided me with the skills and confidence to excel in speaking engagements. #1: Avoid showing distress or lack of confidence. Regardless of who you are, you will make mistakes during a speech. You might say something silly, or lose your thought process. When this happens to you, quickly review your notes, and hope something in your notes will jog your memory. Avoid a long pause. You must have an emergency point or topic that will keep the speech moving forward. Unless you are performing at a comedy club, avoid joke telling. While some people might laugh, many others might not like your humor, or not get the punch line. Just as important here, be careful about getting a laugh at the expense of an audience member. This tactic might be a turnoff, and might cause resentment among the attendees. #2: Ask the audience to participate. As a college professor for many years, I’ve learned that engaging my students is an excellent strategy to maintaining control of my presentation. When I get signs that the audience is daydreaming too much, I am prepared with a learning team lesson. I can also ask questions of the audience, but at times responses tend to be measured, which fails to generate the strong interest I’m seeking. Be prepared with a case study, or any other lesson that breaks the monotony. Of course, make sure you give the impression that it’s planned. You can even make an announcement at the beginning of the session regarding this type of exercise. #3: Be quick to acknowledge a mistake, but don’t show lack of knowledge or weakness in your subject area. As a professional, you are hired to speak on subjects on which you are considered an expert. I often teach IT to IT people. I’m sure they know more about some technical subjects than me, but the difference is that I committed many hours preparing for the workshop. In many cases, I developed the curriculum. You must exude confidence. In other words, show that you belong. You should not convey the attitude of a “know-it-all,” but that you are good at what you do. If a question or topic catches you off-guard, let the person know that you will research it and have an answer soon. In many cases, the person asking the question has a narrow understanding of the topic, and might be looking to look good before his peers. 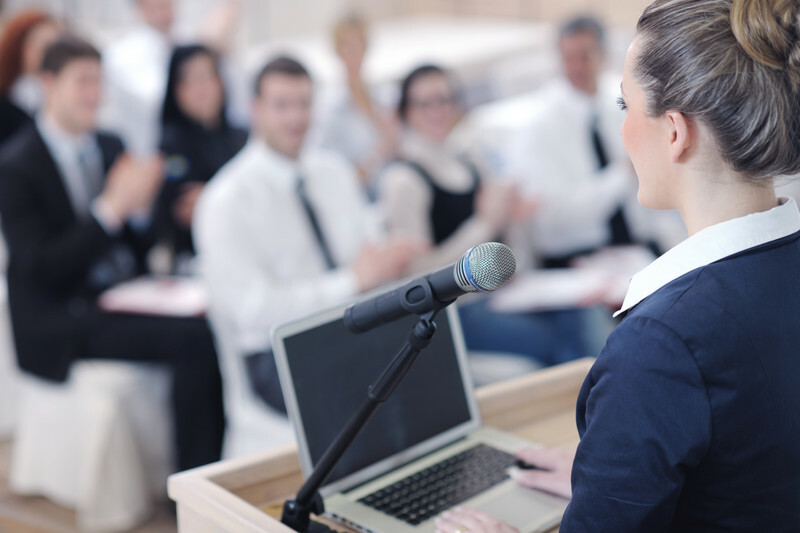 Becoming skilled as a public speaker takes practice, more practice, and even more practice. Accept as many opportunities to present before a group as you can. Before long, you will develop the confidence to impart excellent knowledge to others, and even keep them entertained.